Acrylic awards are a brilliant trophy choice. Their achievements and recognition will shine. Clear acrylic with gold on bottom that reflects up through the award. Your text and graphic laser engrave a frosted white. Individually boxed. 3/4" thick clear polished acrylic award on a black and gold acrylic base. The gold on the base reflects onto the top beveled edge of the clear acrylic, giving it a gold "halo." Text laser engraves a frosted white. Bulk packaged. Brrr! 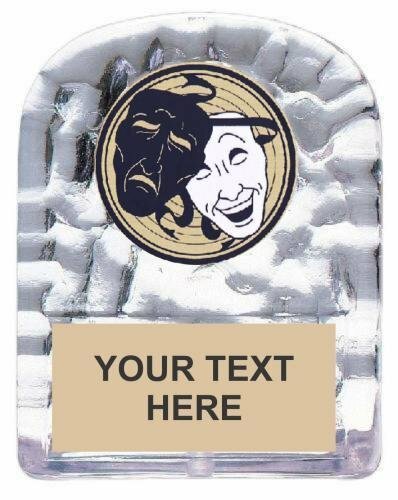 Molded acrylic trophy ruggedly reflects your recognition in cool, icy splendor. Includes your choice of mylar insert on top half of award, with a printed plate on the bottom half. 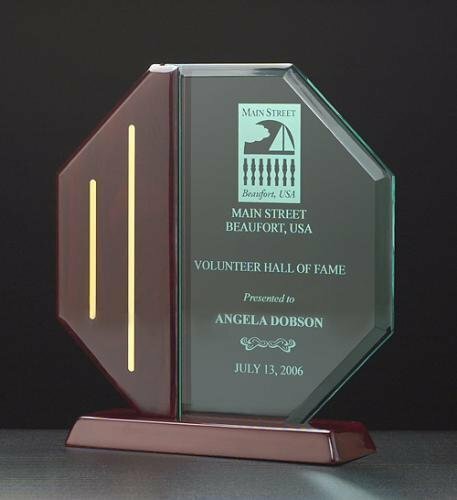 Jade-colored 3/8" thick acrylic meets up with piano finish rosewood and gold metal accents to create a winning recognition award. Laser engraves a frosted white. Individually gift boxed. 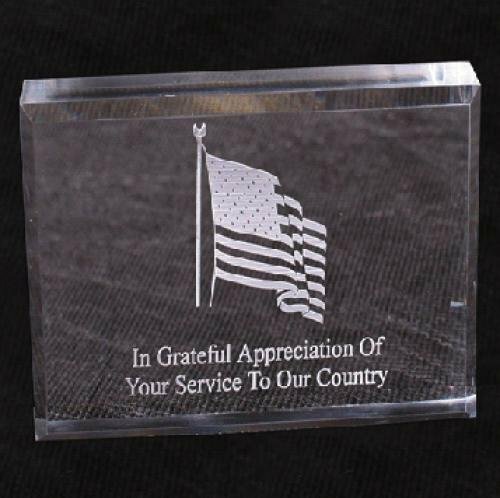 Clear polished acrylic paperweight with beveled edges. Laser engraves a frosted white. Bulk packaged. 3-1/2" x 4-1/2" x 3/4"
The acrylic Phoenix award has risen. With clear arched acrylic between winged metal uprights, a black acrylic base completes this executive award. Laser engraves a frosted white. Individually boxed. Production lead time for this award is 5 days. This award has a maximum order quantity of 5. The acrylic Phoenix award has risen. 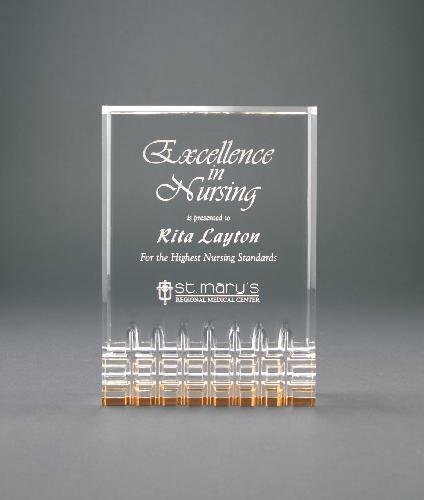 With clear faceted acrylic between winged metal uprights, a black acrylic base completes this executive award. Laser engraves a frosted white. Individually boxed. Production lead time for this award is 5 days. This award has a maximum order quantity of 6. 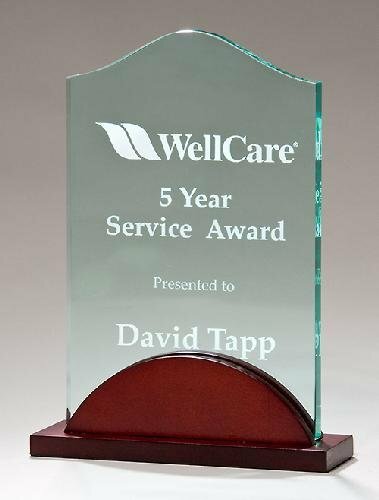 Acrylic award on mahogany finished base, with 3/8" thick jade stand up acrylic. Laser engraves a frosted white. Individually boxed. 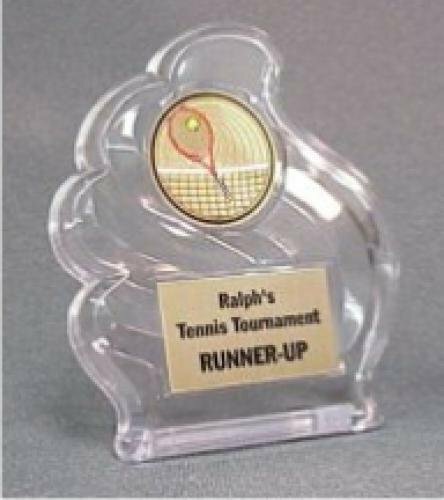 Dive in to savings with this molded economyacrylic trophy and save with quantity discounts on team awards. Includes your choice of mylar insert on top half of award, with a printed plate on the bottom half. Production lead time for this trophy is 5 days. This trophy has a maximum order quantity of 25. 5/8" thick polished clear acrylic with black background on a black acrylic base. Text amd graphics laser engrave a frosted white. Bulk packaged. Production lead time for this product is 5 days. This product has a maximum order quantity of 1.